MAC Retro Matte Liquid LipColour has returned with some new really great looking shades and I recently picked up four of the ones I felt I couldn’t live without. There are eight new shades in the lineup, and I believe 14 total shades overall. 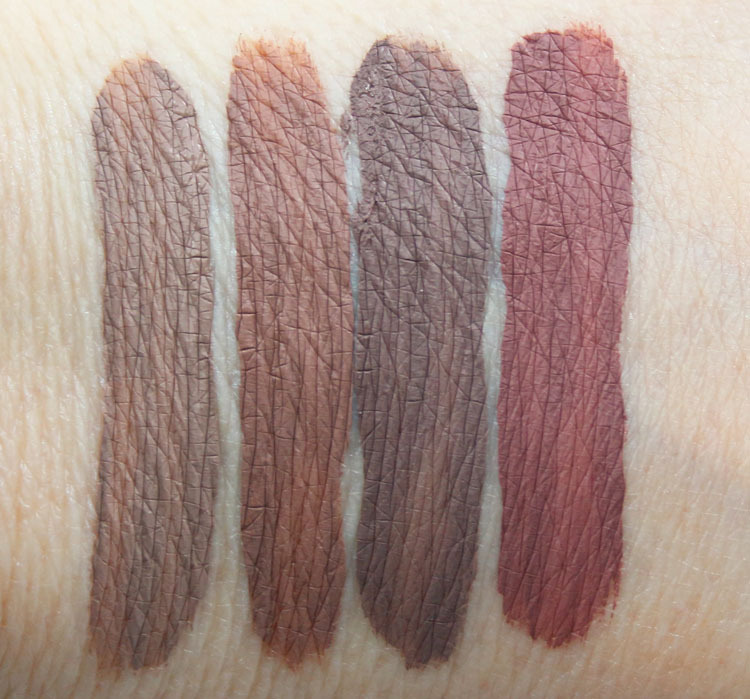 These have a “liquid suede” texture (their words) and they are very pigmented and easy to apply. They dry to a very matte finish. I know some people don’t love these because they are on the drier side of the matte liquid lipsticks out there, but I find I can wear them usually (unless it’s a very chapped-lip kind of day) as long as I use a lip balm under or over them to help with hydration. Flesh Stone is a grey/light taupe. Cafe Au Chic is a greyed out beige. 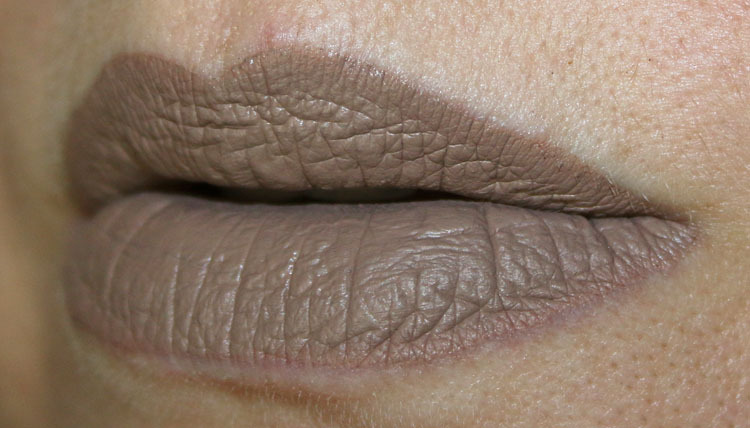 Simply Smoked is a medium brown taupe. So Me is a greyed out plum/rose. As you can see all of these have a greyish/muted quality to them, which is what drew me towards them in the first place. I love these kinds of colors and have ever since I bought my first MAC Folio Lipstick back in 1995. Still one of my favorite shades! Of these four, though I do like them all, my favorites are Flesh Stone and Simply Smoked. I love how evenly they all applied and they are super smooth going on. No streaks, no blotchiness at all. They dry within 1-2 minutes and are very matte and on the drier side. but again, with a lip balm underneath or over (or both) they feel much more comfy. You can find MAC Retro Matte Liquid LipColour on the MAC site now and they are $21.00 each. Do you love any of these shades? Thanks for the great swatches! I wish I could wear them, but there’s jusrt something about my skintone that doesn’t agree with grayish colored lips. It’s too bad since I love those kind of colors on others. Yeah they aren’t easy shades to pull off for some skin tones. Kelly, they look great on you! They just aren’t colors that I would wear! So Me might work for me, being as pale as I am I might look really odd in the other colors. These look beautiful & the shades are right up my alley! Must check them out. Thanks for sharing! So Me is a beautiful color. Thanks for the swatches! 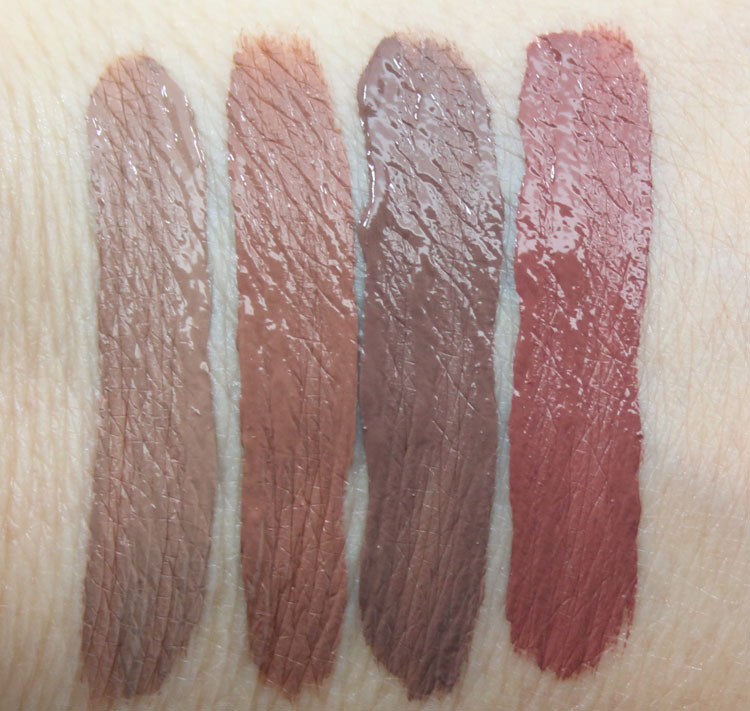 These MAC Liquid lip colours are amazing, I love the shades.